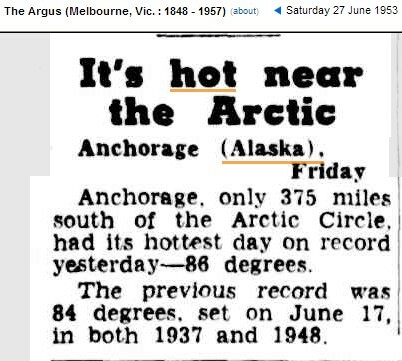 Shock News : Alaska Just As Hot As 60 Years Ago! 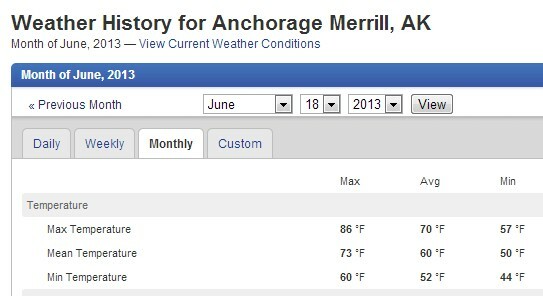 4 Responses to Shock News : Alaska Just As Hot As 60 Years Ago! When you take a hike out in the Boreal forest and dig between the Dwarf Black Spruce tomorrow, you’ll find ice at 5.5″. When you go back August 15th you might find a full 12″ of active layer that has thawed, but no more. Take a look at the Boreal Dwarf Black Spruce and tell me global warming is making these 100+ year old trees grow faster, with a deeper active layer during the summer. They’re going to hype up every thing. When I heard this on the weather forecast, I knew this was coming. 1953 was prehistoric, no satellites, no temperature adjustments by expert climate scientists. Can we really rely on early man’s ability to read a crude thermometer without asphalt around and without any agenda? Yes and in 1953 Artic Sea Ice was still Artic Sea Ice. It didn’t matter then how far off shore the Sea Ice was, it was still considered Sea Ice. Recently the warmest got caught with their hands in the cookie jar, or I should say the ice bucket by under stating the extent of Artic Sea Ice by as much as 5,000,000 square Kilometers.